I think I have gotten accidentally tipsy almost every night on this trip. I’m really embracing the whole wine-drinking culture. But today it was totally intentional. We decided we wanted to go out on the town since we don’t have classes on Wednesdays. So we found this place called Cosmopolitan Bar that has 2€ shots and 4,5€ mixed drinks. When we got there, it did not say that. All it said was 4€ mojitos. We decided that was fine with us. 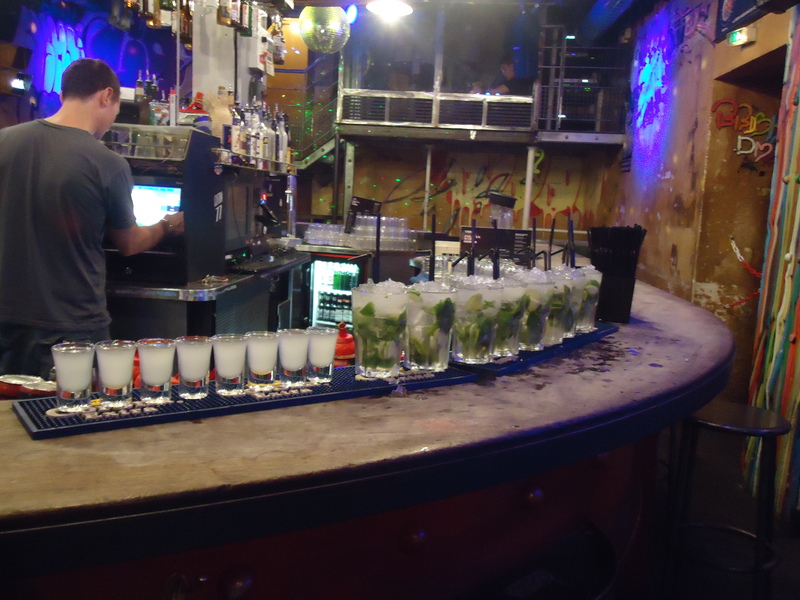 We ordered eight mojitos and eight Kamikaze shots. As a side note: a Kamikaze shot was my very first ever shot. Thanks Mom. The bar looked like our own personal drunk fest. I mean, yes it was empty when we got there for 9-10 p.m. happy hour. But yes, we did fill up the place. So it was fine. And we got more personal time with our lovely Australian drink artisan. Essentially, we got pretty wastey-pants. Then we decided getting more liquor at the little convenience store across the street was a great idea. It wasn’t. One member of our group (name omitted to protect the guilty) kept insisting to the store owner that we were américain rather than américaine. Basically, she was accidentally calling us all men. Then we decided McDonalds was a good idea. It also wasn’t. But it was delicious. So I guess last night was a success.